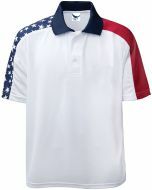 The ultimate patriotic polo, this made in USA ladies polo shirt shows your true American pride. Shoulder colors are sublimated so they won't fade or discolor. Sublimated colors also stay soft since the fibers are dyed, not printed. Rounded square buttons and ottoman pattern on the collar for a nicer fashion look; lightweight and soft moisture wicking poly to minimize maintenance and keep your shirt looking good. Red, White and Blue flag patterns are sublimated on sleeves so they won't fade. Lightweight and soft moisture wicking poly for minimal maintenance and long lasting style.